The global car rental market is driven by the growing number of inbound and domestic travelers. The increasing number of air travelers is also positively impacting the growth of this market. Travelers across the globe are demanding high quality and reliable travel services for their tours. Leading car rental service providers are offering quality services and promoting their brands at airports and this is helping customers to adopt their services. Players in the market are concentrating on broadening their fleet size by including technical gadgets. Gadgets such as GPS and music systems are being used increasingly for profitability. This is expected to intensify the competition among players in the years to come. However, the fluctuation of oil price will restrict the growth of this market. The growing price of petrol and gasoline will affect the consumer spending level and this expected to act as a challenge. On a positive note however, the rise in GDP levels and increasing disposable income of consumers will have a positive influence on the market. North America accounted for 30% of the market in 2015. In 2015, the North American market was worth US$26.40 bn. The Hertz Corp., Avis Budget Group Inc., and Enterprise Rent A Car are key companies from the U.S. and Canada. The European market for car rentals will also witness high growth during the coming years. France is expected to be a leading contributor to the European car rental market. Europe is expected to be the second lucrative regional market in the car rental market. The strengthening position of the medical tourism industry will drive the Asia Pacific market for car rentals during the period from 2016 to 2024. On the basis of category, the global car rental market is segmented into local usage, airport transport, and outstation. Of these, the airport transport segment is anticipated to contribute the most to the growth of the car rental market. The increase in the number of air travelers and increasing industrialization will push the growth of this segment in the years to come. The local usage segment will trail the airport transport segment. The high increase in the demand and adoption of cab sharing and car pool services will drive the car rental services for local usage. The penetration of information technology in the car rental industry has made car bookings and car reservations much simpler, reliable, easier, and safer and thus, customers are increasingly adopting these services. Stringent emissions standards by governments across countries will hamper the growth of this market. The increasing number of warnings by The International Energy Agency regarding the rising emissions of carbon dioxide will restrict the growth of this market in the years to come. International meetings and agreements are demanding mature economies and emerging nations to reduce carbon emissions. Thus, green movement has become a trend that is becoming popular. Leading companies are thus, adopting green car rentals. Car rental has emerged to be one of the most prominent services operating in the urban transport sector.Rising demand for car sharing, growth of megacities and increase in the number of business travelers are some of the crucial reasons which will lead to a huge growth in the car rental industry. The leading car rental companies operating in the global market such as, Avis Budget Group, Inc., The Hertz Corporation and The Sixt Rent, have been adding cars to their existing fleet which have advanced telematics and navigation solutions. The market is highly competitive with several international and regional companies operating in the market. A car rental company rents and leases vehicles for a particular period of time for a specified amount of fees. The time can range from a few hours to a few months. Car rental companies are also accompanied by websites for allowing online reservations which are hassle-free and convenient compared to traditional reservation methods. The car rental industry is majorly driven by expansion and growth of the travelling and tourism industry. The globally rising disposable incomes, coupled with enhanced road infrastructure are the key factors which have boosted the number of leisure and business trips, this in turn will drive the growth trajectories of the global car rental market. In recent years, the car rental industry has witnessed implementation of information technology. The use of internet for arranging trips and online reservations is becoming increasingly prevalent. The advent of information technology in this industry has made the entire procedures of booking and reserving trips quicker, safer and easier and reliable for the customers.However, tighteningof emission standards and volatility of crude oil prices is expected to have moderate negative impact on the car rental industry.The International Energy agency has constantly warned about the increase in carbon dioxide emissions over the years. Many international meetings and agreements have demanded both the emerging and mature economies to cut down emissions significantly. Thus, this factor creates the need for green energy generation, in order to reduce carbon dioxide emissions and overall environmental pollution. As a result, leading companies, such as Enterprise Rent-A-Car, have adopted green car rentals. Other players are also aiming to adopting the same soon. 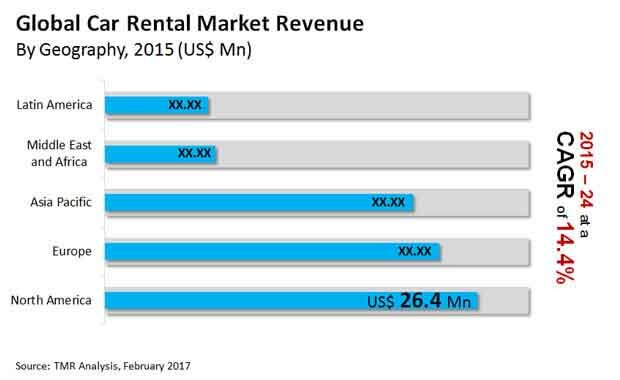 The global car rental market report segments the market on the basis of geography as North America, Europe, Asia Pacific (APAC), Middle East and Africa (MEA) and Latin America, and these have been estimated in terms of revenue (USD billion). The report also segments the market based on the types of cars, which include luxury cars, executive cars, economy cars, SUV’s and MUV’s. The global car rental market is further segregated on the basis of category into local usage, airport, outstation, and others (self-drive, event transportation, employee transportation solutions). All these segments have also been estimated on the basis of geography in terms of revenue (USD billion). For a more detailed understanding of the market, a supply chain analysis along with Porter’s Five Forces analysis has been given. These two analysis will give a brief idea about the intensity of competition present in the market. Additionally, our study also provides a market attractiveness analysis, where the car type segment has been analyzed based on their market scope, general attractiveness and growth rate. The report provides company market share analysis of various industry participants. The company profiles are inclusive of the company overview, financial overview, business strategies, SWOT analysis, and recent developments in the field of car rental. Some of the major market participants profiled in this report include Enterprise Rent-A-Car, The Hertz Corporation, Avis Budget Group, Inc., EuropCar and Sixt among others.